Blood in the Forest tells the brutal story of the forgotten battles of the final months of the Second World War. While the eyes of the world were on Hitler's bunker, more than half a million men fought six cataclysmic battles along a front line of fields and forests in Western Latvia known as the Courland Pocket. Just an hour from the capital Riga, German forces bolstered by Latvian Legionnaires were cut off and trapped with their backs to the Baltic. The only way out was by sea: the only chance of survival to hold back the Red Army. Forced into uniform by Nazi and Soviet occupiers, Latvian fought Latvian - sometimes brother against brother. Hundreds of thousands of men died for little territorial gain in unimaginable slaughter. When the Germans capitulated, thousands of Latvians continued a war against Soviet rule from the forests for years afterwards. An award-winning documentary journalist, the author travels through the modern landscape gathering eye-witness accounts from seventy years before piecing together for the first time in English the stories of those who survived. He meets veterans who fought in the Latvian Legion, former partisans and a refugee who fled the Soviet advance to later become President, Vaira Vike-Freiberga, A survivor of the little-known concentration camp at Popervale and founder of Riga's Jewish Museum, Margers Vestermanis has never spoken about his personal experiences. Here he gives details of the SS new world order planned in Kurzeme, his escape from a death march and subsequent survival in the forests with a Soviet partisan group - and a German deserter. With eyewitness accounts, detailed maps and expert contributions alongside rare newspaper archive, photographs from private collections and extracts from diaries translated into English from Latvian, German and Russian, the author assembles a ghastly picture of death and desperation in a tough, uncomfortable story of a nation both gripped by war and at war with itself. 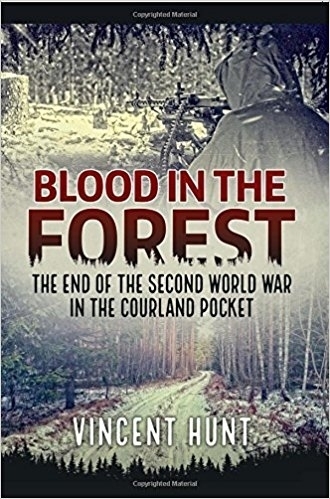 Vincent Hunt, in his account of the final months on the Eastern Front: “BLOOD IN THE FOREST, The End of the Second World War in theCourland Pocket”, has woven personal stories from soldiers and refugees together with military accounts and available official documentation to create a gripping, emotional narrative.The last months and weeks of the Courland pocket, from October 1944 to May 1945, included 6 major battles and cost roughly 500,000 casualties. The book chronicles such a stream of events in a relatively small place and time that we can but scarcely imagine, yet all of this happened in living memory. It is a story well told, and worth telling.It is an emotional read, born of persistence in searching for the truth. The author has strived and succeeded in achieving historical balance, covering little-known details about the holocaust and describing the fighting from both sides of the front. It includes unique interviews with Latvia’s ex-President, Vaira Vīķe-Freiberga, who was a refugee herself, and Marğers Vestermanis who was a holocaust survivor, partisan, and founder of the Rīga Jewish Museum. The book includes descriptions of the Latvian countryside that paint the picture of what it must have been like to be there, as well as what it is like now, where the trees on the old battlefields are still full of shrapnel.